Often we see questions about acquiring data from various data sources like SQL Server Databases, MDBs, Excel and text/xml-files in webbased Q&A forums and in blogs. But what I see very rarely is any discussions on how to retrieve data from Microsoft SQL Server Compact Edition (SSCE) databases and to populate Excel worksheets with the acquired data. This article will introduce how to use SCEE databases as data sources and dump the retrieved data into a pre-defined range in a worksheet. 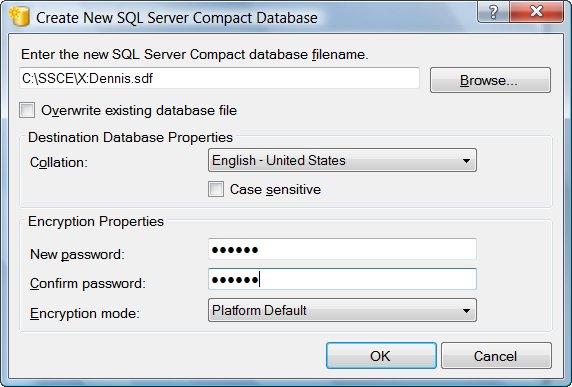 SSCE is a lightweight version of the SQL Server database engine. It requires a minimal installation and configuration to use. Unlike its bigger “brother” it’s a server less database engine. This article describes how to proceed to get data into an Excel solution from a SSCE database by using VBA. But before diving into it let us first take a look on how to create a SSCE database and its limitations. When the database has been created we need to add the wanted tables and their contents inside the SQL Server Manager Studio. But what if we have a SQL Server database and would like to convert it to a SSCE database? The easiest way I have found out is simple to use a third-party tool to do it for us. In my opinion the best tool for the job is the inexpensive Data Port Wizard tool from Primeworks. 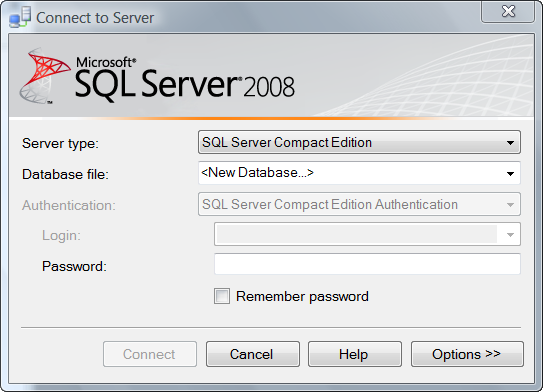 In addition to convert SQL Server databases it can also convert in a smooth way MS Access databases to SSCE databases. In other words, it shouldn’t be difficult to port these database types to SSCE database type. SSCE is on its face very attractive but before we get carried away we need to take a closer look into its limitations. The most important limitation, in my opinion, is that the SSCE does not support the use of views, stored procedures or functions. In other words, its main job is to store larger sets of data and make the data available for mobiles and desktop applications and nothing else. The maximum database size is 4 GB which is in my world is a rather large database size. But by default the data size is only 256 MB and to change the size change we need to add the parameter Max Database Size=xxxx MB to the connection string. The maximum rowsize is 8060 bytes but since this exclude text and blob fields there exist rarely a practical limitation, at least not in my experience. It does not support ASP/ASP.NET which does not affect me at all. Edit: SSCE targets individuals only, i.e. it does not allow multiple users to access a database simultaneously which SQL Server and the Express Edition allow (see Mathias comment below). The next thing I feel I must point out is the driver to use with SSCE databases and the required system files for running them. When distributing solutions that involve SSCE databases we must also distribute theses files. Actually, in my experience this is a must in all cases. To do so we first need to get the redistributing MSI file which we do by downloading the package Microsoft SQL Server Compact 3.5 Service Pack 2 for Windows Desktop. When running the EXE file we get the required MSI file for x86 as well as the MSI file for the x64 platform. Actually included in the package is also the MSI file that includes both these two files. What is also notable is that although we know it’s available the driver does not show up in the Data Link Wizard or in the .NET Wizard. Because of its anonymous character we can only get the correct connection string by trying. 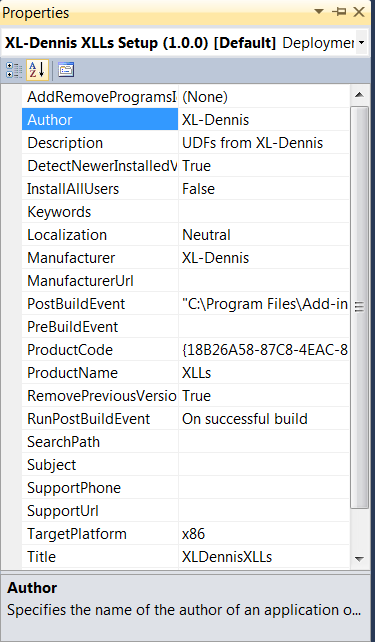 But a good start for the efforts is SQL Server Compact Edition Connection Strings Samples. 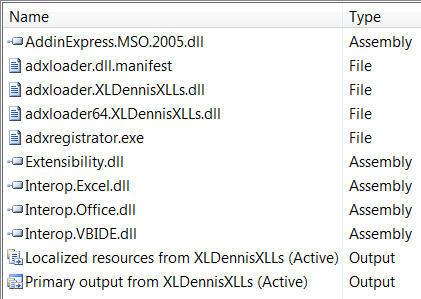 'ActiveX Data Objects 2.5 Library or later. 'Name of the SSCE database. 'The SQL Expression to be used. Const C_stSQL = "SELECT CompanyName AS Company, City FROM Customers;"
'Path to the SSCE database. "Data Source=" & stPath & C_stDBName & ";"
'Open the connection to the databas. 'Populate the worksheet with the field names. 'Dump the data into the worksheet. Because of the limited differences between VBA and VB.NET I decided to exclude the sample when using VB.NET. I believe it should not be a problem for You. I have also published a post about how to create a SSCE database with VBA. 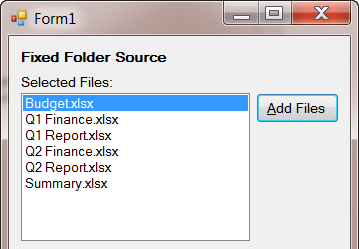 It’s quite often that we need to work with folders in various Excel solutions. It involves creating, deleting, moving, copying and update folders with or without any user interactions. In this article I will discuss and show the code in order to work with folders. 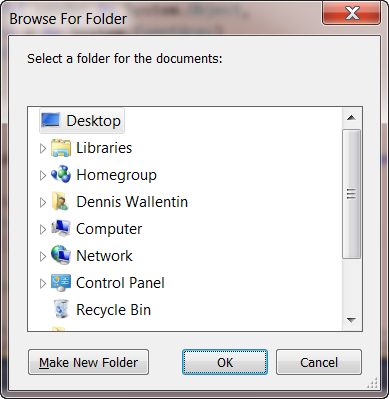 In the first part I will cover the basic processes to handle folders and in the second part of the article I will discuss folders and some user interactions. Before we start up we should make sure that we have a reference to the System.IO namespace in the project and that we have made an import statement at the top of the class module. We will be using classes and methods that reside in that namespace. 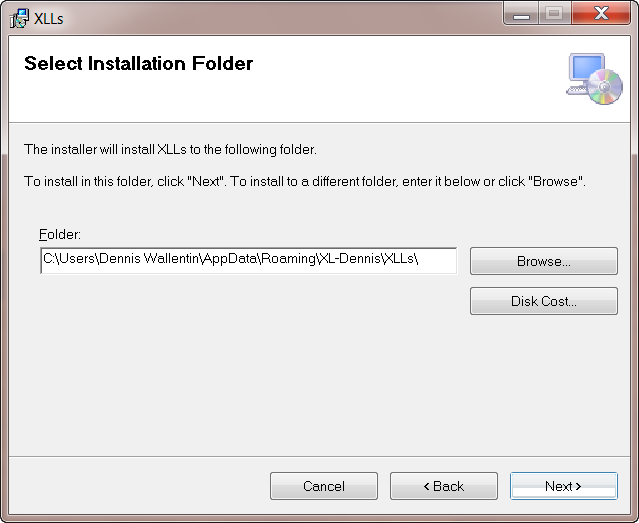 Const NewFolder As String = "c:\Users\Dennis Wallentin\Document\Code"
'If it not already exist we create the folder. 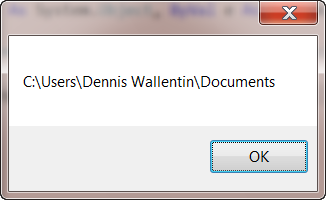 Const DeleteFolder As String = "c:\Users\Dennis Wallentin\Document\Code"
'If it exist we delete the folder. 'If it exist we delete all the files and the folder. To move files and subfolders from one location to another is also an easy task to achieve. What should be noted is that the old folder is always deleted and that the new folder cannot exist when the code is being executed. If the folder already exists the code will throw an exception. The code snippet below shows the details. Const Folder As String = "c:\Users\Dennis Wallentin\Document\Code"
Const Target As String = "c:\Test\Dennis"
'The new folder cannot exist. To copy a folder’s content to a new location requires another strategy then what we so far have been used. Instead we must use the method My.Computer.FileSystem.CopyDirectory which also the following code shows. The last parameter controls if any existing files should be overwritten or not. Const Folder As String = "c:\Users\Dennis Wallentin\Document\Dennis"
Const Target As String = "c:\Test\Backup"
The CopyDirectory method has two additional parameters that we can use whereof one can be rather useful here. If we know that we will be handling large files or a great number of files that will take some time to copy then we can let the users know about it. To do so we add the parameter ShowUI to the code as the below code also shows. And as we also can see from the screen shot the user can cancel the operation if necessary. Since the other methods of My.Computer.FileSystem are focused on single items they are of little interest in this context. 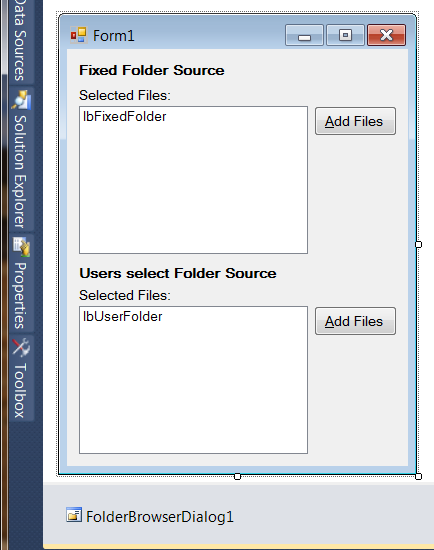 If You are used to use the SHFileOperation Function then it has been replaced with the IFileOperation Interface. For more information about the later please see IFileOperation Interface. 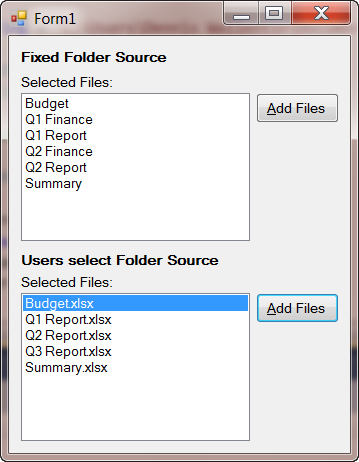 It’s beyond the scope for this article to discuss SpecialFolders but I would like to show a basic example on how we can work with Special Folders. The UI design for the two cases, with some user interactions involved, is showed in the below screen shot. 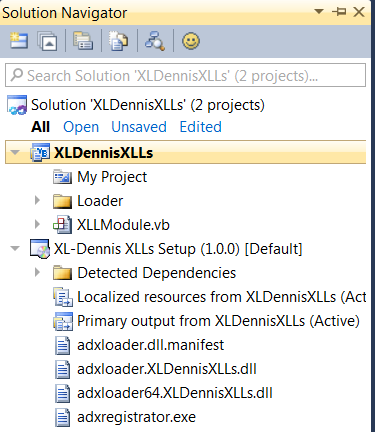 Const Folder As String = "C:\Users\Dennis Wallentin\Documents\Fixed Folder"
Const Title As String = "Select a folder for the documents:"
I hope that the above has given some insight on how to work with folders in the VB.NET language. 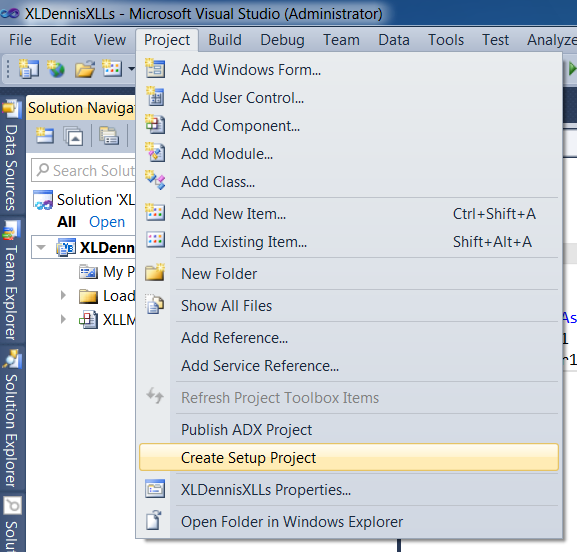 This is the second article about creating XLLs with Add-In Express.NET and it will focus on creating a Setup package for our solution. The first article about it can be viewed here. 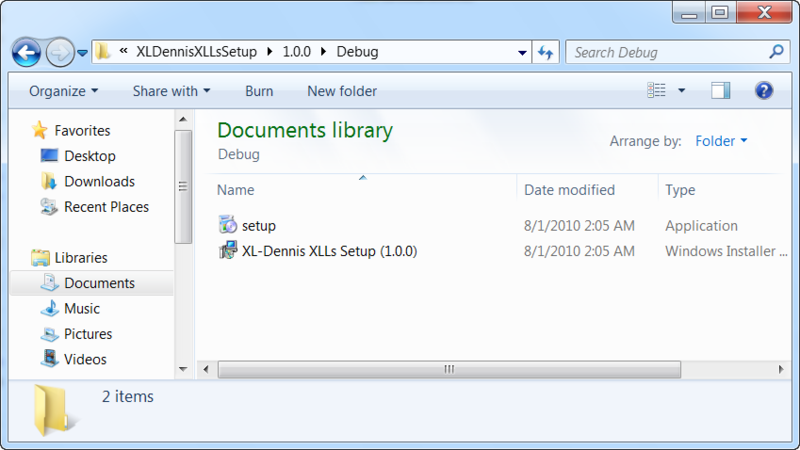 The next file, adxloader.XLDennisXLLs.dll, is the loader on the x86 platform while the file thereafter is the loader on the x64 platform. 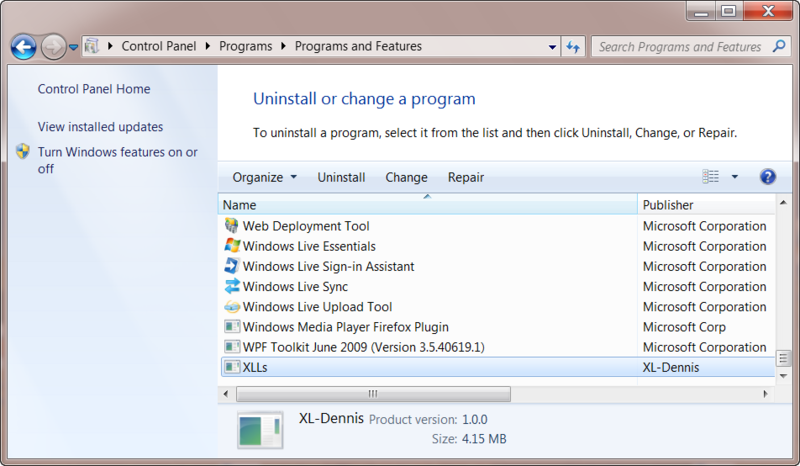 In other words we can with the Add-in Express.NET tool target both platforms with only one solution. 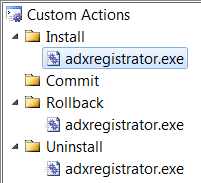 The last added file, adregistrator.exe, creates all the required entries in the Windows Registry and also remove them when uninstalling the solution. Keep in mind that we, upon creating the solution, decided to include version-neutral IAs to the Setup package. That’s why the Interop files are included. 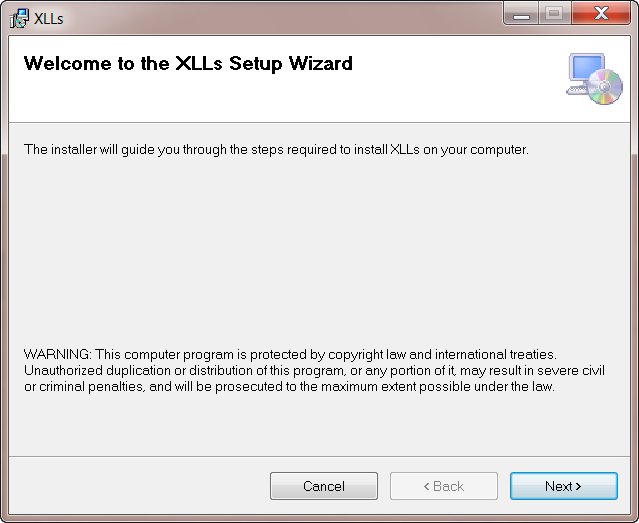 The Extensibility.dll file includes the IDTExtensibility2 Interface so the file is vital for solutions that make use of it. 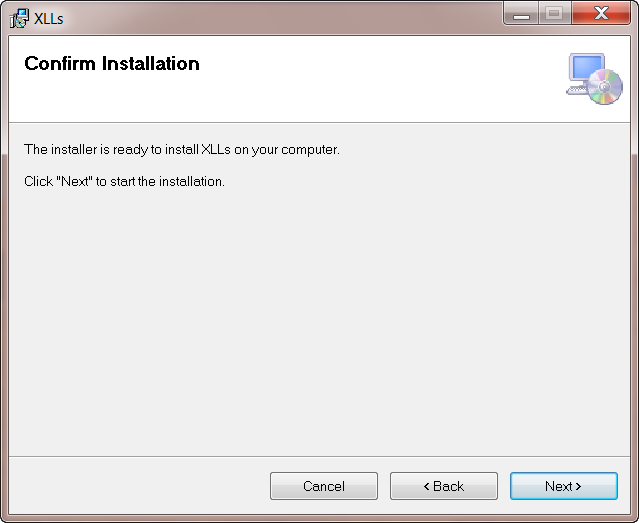 When reviewing the basic Launch Conditions it only includes the requirement of having .NET Framework 4.0 installed on the targeting computers which the below screen shot shows. In addition, we can add our own launch conditions to the Setup project which makes it very flexible. Now we have a Setup package that can be deployed in order to install our solution. 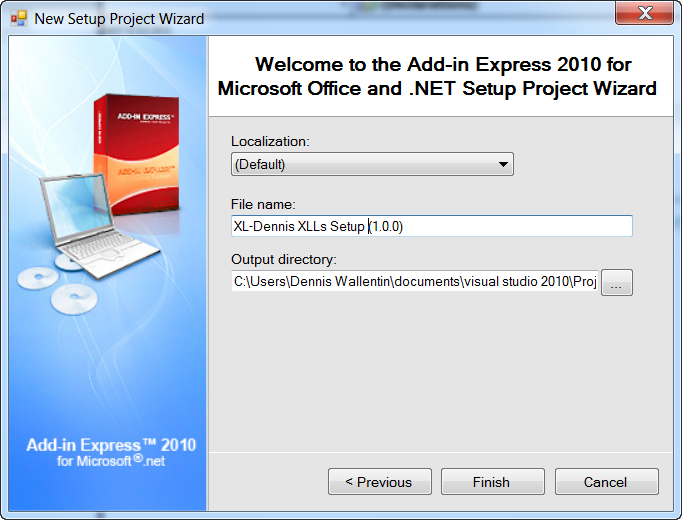 It’s very easy and simple to create a Setup package with the Add-In Express.NET tool. 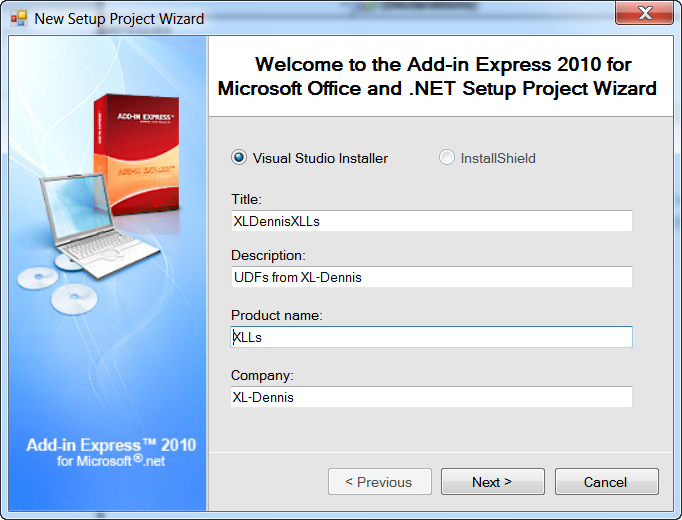 It’s also flexible and time saving and it requires little effort to get a professional Setup package by using the Add-In Express.NET tool. 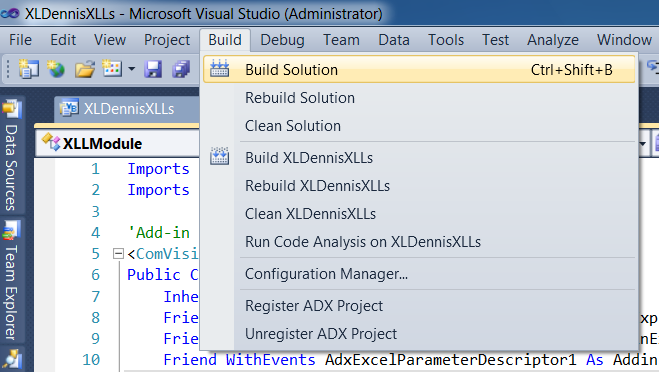 In the next article, which is also the last one on the subject, I will discuss the pros and cons with using Add-in Express.NET for creating XLLs solutions.